Quality professionals use AQL sampling tables to determine the acceptance or rejection of inspection material. Inspection material can be raw goods, purchased parts, inprocess production, final goods and services, pre and post shipment parts, etc. Inspectors depend on AQL plans to determine the amount of parts to inspect. AQL stands for “Acceptable Quality Level”. AQL is the poorest level of quality for the process that you would consider acceptable. First select the appropriate industrial sampling plan. Accept or Reject the remaining parts. Probably the most difficult step of the sampling stages because selecting the correct AQL sampling plan depends on your situation. Are you inspecting parts for receiving inspection? Are you monitoring production? Do you know the history of defects for the material? Are inspecting for safety issues? Do you allow for defects during sampling? There are many statistical AQL sampling plans. Authors established these plans based on different situations. Some plans were written for lot inspection, while some for production inspection. Some plans focus on safety related issues, while some cover major and minor features. Some plans allow for reduction of inspection when defect levels decrease, some don’t. Some plans allow for defects (or inspection mistakes), some don’t. Because of the complexity, there are college level courses that cover sampling theory. These courses detail the major plans and elaborate on the AQL tables. Fortunately, you don’t have to take a college course to learn this material. Snap Sampling Plans! 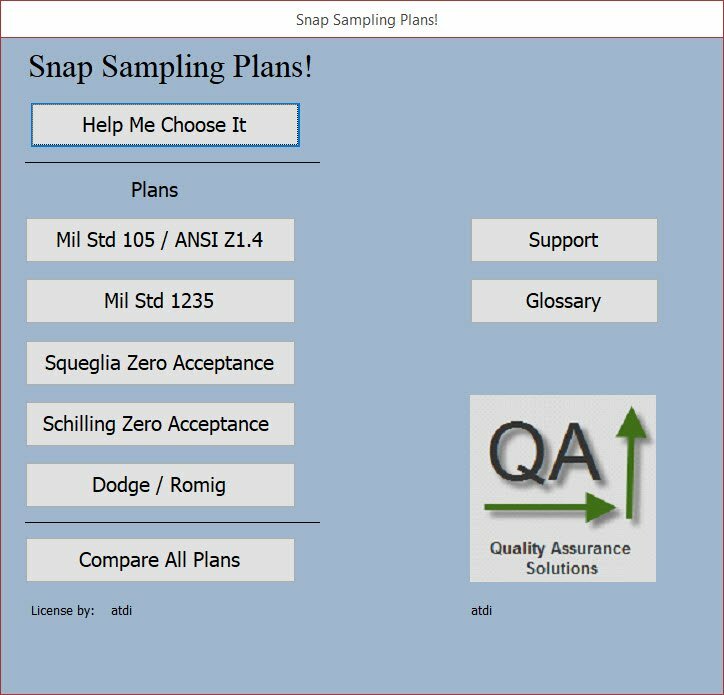 quickly lets you select and apply the correct AQL sampling plan. You establish the AQL % depending on the feature that under inspection. If the feature has high importance, you will select a lower AQL. AQL percentage can be as low as .01% and the highest AQL can be 10%. You select a number in between these two. In many cases, your customer already determined the AQL. To find this information, check the customer drawing or contract. Sampling plans provide tables with multiple AQLs. In general, each plan has a given limit of AQLs. The AQL table shows one column with the AQL percentage and another column with a code letter that represents the lot size. In some cases these can be hard to interpret because you may need to refer to multiple tables to actually find the exact sample size. Since the authors wrote each AQL sampling plan to cover a given inspection situation, each plan has different parameters. Two of the common parameters for each plan is AQL percentage and lot size. Other parameters include defect percentage, sampling level, inspection level, and inspection type. Without reading the standards or receiving training, the parameters can be confusing. Again Snap Sampling Plans! simplifies the selections for the users. Within the standards, for each different parameter, there are different tables. When changing the parameters, you increase the time to find your inspection sampling plan. Open the standard, review table A which takes you to table C which takes you to Table D. Find your inspection criteria on Table D. Changing parameters is very time consuming. Snap Sampling Plans! software fixes this. The main reason that the authors wrote each plan was to determine the sample size, accept and reject criteria. After finding this you are done with the standards until the next inspection. The sample size number tells you how many parts to pull from the lot. The accept number tells you the maximum allow number of rejects within that sample to accept the lot. The reject number tells you the minimum number of defects within the sample to reject the lot. Select the parts randomly from the lot is critical to making a sound decision on the lot. If you pull the parts off the top of the pile for the inspection sample, this is not random inspection. In this case you are pulling parts from one moment of production time and that moment does not represent the entire production. Random means that the sample comes from an unknown origin. There are many tools that generate random numbers. Many calculators have this built in feature. After you select the inspection sample you then inspect the parts. As you inspect the parts, you separate the good parts from the bad parts. You record the number of good parts and the number of rejects. You may be inspecting multiple features or characteristics on the parts. Depending on the feature importance, you may have different AQLs or Inspection parameters for each feature. This is difficult to master if you are relying on reviewing the industry standard for each feature. If you’re doing this, try using Snap Sampling Plans! which makes multi-feature inspection easier. Based on your accept / reject number and the end results from the sample inspection, you decide whether or not to accept the material. If the number of defects is less then or equal to the accept number you accept the parts. Move the parts to the next step. If the number of defects is greater or equal to the reject number you reject the parts. Segregate the lot and issue corrective action.